Archaea are ubiquitous microorganisms that thrive in diverse habitats around the globe, ranging from extreme environments, such as boiling hot springs, salt lakes or marine hyperthermal vents to ambient environments, such as fresh water springs (Perras et al., 2014) and the human body (Lurie-Weinberger and Gophna, 2015). While extremophilic Archaea are of great interest for biotechnology, Archaea that are part of the microbiome of the human digestive system have been implicated in obesity (Mbakwa et al., 2015). Fundamental to their prolific diversification is the capability of archaeal cells to move through liquid media. In the course of evolution, Archaea have developed their own locomotion machinery called the archaellum, which is distinct from bacterial and eukaryotic flagella in terms of molecular composition and mode of action (Albers and Jarrell, 2015). Whilst eukaryotic and bacterial flagella have been studied in detail (Krüger and Engstler, 2015; Chen et al., 2011; DeRosier, 2006), less is known about the architecture and assembly of their archaeal counterparts. 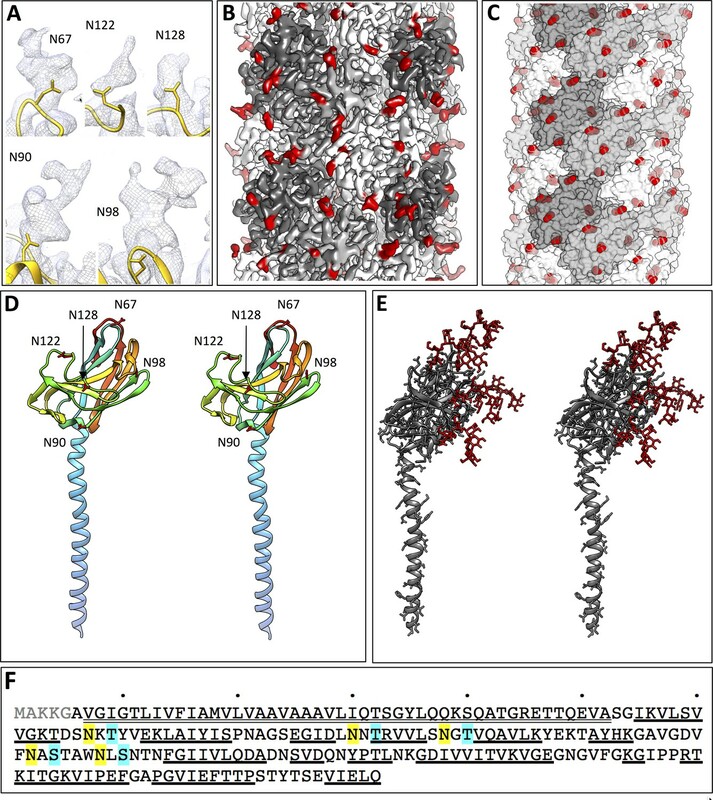 In the past decade, biochemical investigation and conventional negative-stain electron microscopy have established that the archaellum consists of a helical array of multiple copies of 1–5 archaellins with N-terminal sequence homology to bacterial type 4 pili (T4P)(Albers and Jarrell, 2015; Pohlschroder et al., 2011). In contrast to bacterial flagella, recent cryoEM data have shown that archaella are not hollow, indicating that they have to be assembled at their base (Albers and Jarrell, 2015; Poweleit et al., 2016). Furthermore, it has been shown for the Archaeon Halobacterium salinarum that swimming motion is driven by ATP hydrolysis instead of ion fluxes (Streif et al., 2008) and single-molecule studies have recently demonstrated that archaella rotate in a stepwise manner reminiscent of torque-generating ATP synthases (Kinosita et al., 2016). A multi-protein motor complex located in the cell envelope and powered by ATP hydrolysis drives assembly and rotation of the of the FlaA/FlaB filament (Albers and Jarrell, 2015; Chaudhury et al., 2016). Biochemistry and bioinformatics suggest that the core of this complex is formed by the AAA motor ATPase FlaI, a putative regulator FlaH, a membrane-bound platform protein FlaJ and the periplasmic FlaG, and FlaF proteins (Albers and Jarrell, 2015; Chaudhury et al., 2016; Reindl et al., 2013). In Crenarchaeota, FlaH is surrounded by a larger ring of FlaX proteins (Banerjee et al., 2013), which are absent in Euryarchaeota. Instead, Euryarchaeota encode the additional cytosolic proteins FlaC and FlaD/E (Albers and Jarrell, 2015; Chaudhury et al., 2016; Näther-Schindler et al., 2014), which in H. salinarum interact with chemoreceptors via adaptor proteins (Schlesner et al., 2009). 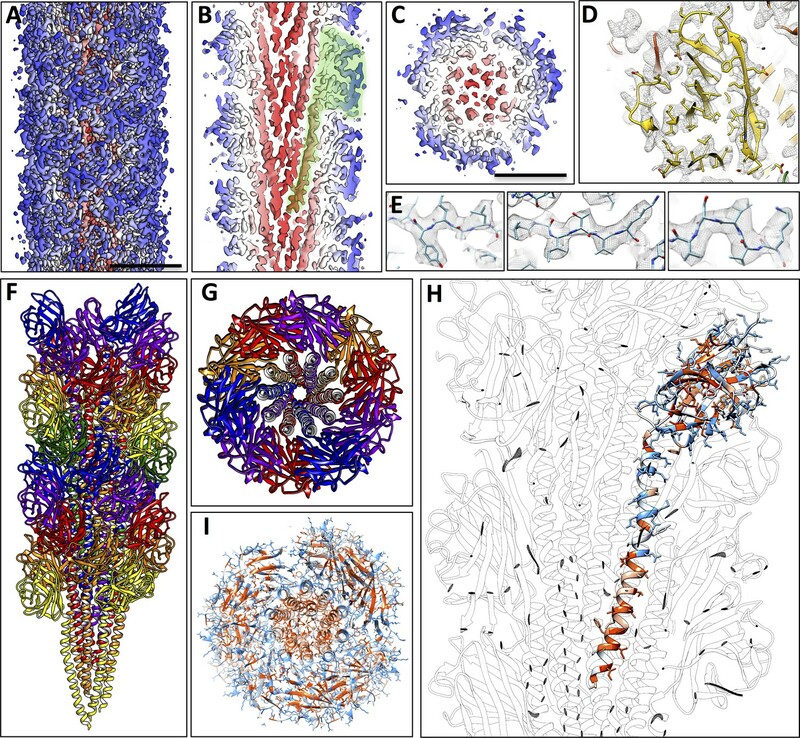 Whilst the X-ray structure of individual subunits from Sulfolobus acidocaldarius FlaF (Banerjee et al., 2015), FlaH (Chaudhury et al., 2016) and FlaI (Reindl et al., 2013) have been solved, the arrangement of the assembled motor complex is unknown. Pyrococcus furiosus is a hyperthermophilic Euryarchaeon that has been isolated from volcanic marine sediments (Fiala and Stetter, 1986). Its genome has been fully sequenced (Robb et al., 2001) and various tools for genetic manipulation are available (Kreuzer et al., 2013; Waege et al., 2010; Lipscomb et al., 2011). P. furiosus is therefore of great interest for basic and applied research and widely used as archaeal model organism. P. furiosus is highly motile (Herzog and Wirth, 2012), grows at an optimum temperature of 95–100°C (Fiala and Stetter, 1986) and assembles numerous archaella on the cell pole (Fiala and Stetter, 1986; Näther et al., 2006). In P. furiosus wild type strains, the fla operon encodes for the three archaellins FlaB0, FlaB1 and FlaB2, of which FlaB0 is by far the most abundant (Näther-Schindler et al., 2014). At present it is not clear whether the three proteins can all be part of the same archaellum or if each forms distinct filaments of their own. Electron microscopy of freeze-fracture replica and scanning electron micrographs of cells grown on a variety of solid supports showed that P. furiosus archaella establish surface contacts as well as cable-like cell-cell connections, suggesting that they also function in surface attachment, intercellular communication and biofilm formation (Näther et al., 2006). We used electron cryo-tomography, sub-tomogram averaging, single-particle cryoEM and helical reconstruction to obtain an in situ map of the P. furiosus archaellar motor complex and a near-atomic resolution structure of its archaellum. In combination, our results provide a first model of the architecture of the archaellar locomotion machinery. 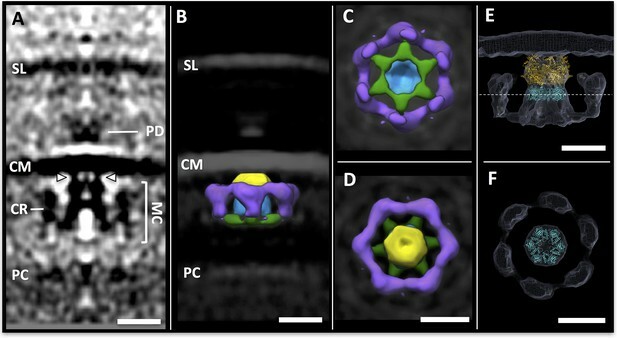 Initial cryoEM showed that P. furiosus cells grown in rich medium, measure ~1–2 μm across (Figure 1—figure supplement 1A–B) and are thus too thick and too dense for electron cryo-tomography. By cultivating P. furiosus on minimal SME pyruvate medium, the cell size was reduced to 500–1000 nm (Figure 1—figure supplement 1C–D). Tomograms of these cells revealed details of their morphology and interior. In roughly 80% of the cells, a bundle of up to 50 archaella protrudes from a bulge at the cell pole (Figure 1A,B). On the EM grid, cells occur individually or in pairs in a range of division states (Figure 1—figure supplement 2A–D). Interestingly, cell division of P. furiosus initially manifests itself in the formation of two indentations at opposite cell poles (Figure 1—figure supplement 2B). Subsequently, one of the two indentations develops into a deep cleft that finally spans the entire cytosol (Figure 1—figure supplement 2C). Towards the end of cell division, the two daughter cells are connected by a narrow cytosolic bridge, which is surrounded by both a plasma membrane and an S-layer (Figure 1—figure supplement 2D). The presence of archaella in P. furiosus seems to depend on the division state. Whilst 86% of non-dividing cells exhibit archaella (Figure 1—figure supplement 2E), this is the case for only ~54% of dividing cells, of which one or both show an archaellar bundle (Figure 1—figure supplement 2F). Furthermore, most of the dividing cells with archaella are in an early state of division (Figure 1—figure supplement 2B). Electron cryo-tomography of P. furiosus. (A) tomographic slice through a frozen-hydrated P. furiosus cell. Arc, archaella; SL, S-layer; CM, cell membrane; Cyt, cytosol; green arrowheads, polar cap. (B) close-up of the tomogram in A, showing archaella on the cell pole. MC, motor complex. Scale bars, 200 nm. (C) percentage of total archaellar bundles observed as well as archaellar bundles observed with and without a polar cap. P. furiosus archaellar filaments have a constant diameter of ~11 nm but vary considerably in length (a few 100 nm to several µm). Each filament crosses the S-layer and spans the ~34 nm periplasmic gap (Figure 1B). As observed previously (Briegel et al., 2017), the archaella traverse the periplasm at variable angles of 60–90° between the filament axis and the membrane plane (Figure 1—figure supplement 3). In the tomograms, the filaments emerge from a basal density on the cytoplasmic surface of the plasma membrane, which most likely corresponds to the archaellar motor (Figure 1B). Each of these densities is located in a ~35 nm gap between the membrane and a sheet-like cytoplasmic structure (polar cap; Figure 1A,B). The polar cap appears to be a hallmark of motile Euryarchaeota, as it has also been observed in related species (Briegel et al., 2017; Kupper et al., 1994). The polar cap has a thickness of ~3 nm, a variable diameter of 200–600 nm and typically straight edges. The edges end in the cytoplasm and are not continuous with the plasma membrane. In its centre, the polar cap is often kinked into a sharp ridge (Figure 4A). We observed the polar cap in all cells in which archaella were present and never in the absence of an archaellar bundle (Figure 1C). To analyse the in situ structure of the archaellar motor complex, we performed sub-tomogram averaging of 379 densities at the base of archaellar filaments. Six-fold symmetry was applied during averaging, as the S. acidocaldarius homolog of the central core protein FlaI has been shown to be a hexamer (Reindl et al., 2013). To validate this assumption for P. furiosus, we overexpressed PfuFlaI in E. coli, purified the protein, recorded negative stain images and performed 2D classification of 130.000 particles, which indeed indicated a hexameric ring structure (Figure 2—figure supplement 1). The sub-tomogram average of the motor assembly reveals a bell-shaped central density projecting 19 nm from the plasma membrane into the cytosol (Figure 2A,B). Proximal to the membrane, the complex has its narrowest diameter of 9.5 nm, and is linked to the bilayer via six ~3 nm protrusions (Figure 2A, arrowheads). Distal to the membrane, the complex widens to a diameter of 18 nm and is connected to a cytosolic ring of 26 nm in cross-section (Figure 2A–D). Sub-tomogram averaging of the archaellar motor complex. (A) tomographic slice through the sub-tomogram average of the motor complex. SL, S-layer; PD; periplasmic densities; CM, cell membrane; MC, motor complex; CR, cytosolic ring; PC, polar cap. Arrowheads indicate two of six narrow connections between MC and CM. (B–D) segmented 3D surface representation of the sub-tomogram average of the MC (multiple colours) as seen from the side (B), the cytosol (C) and the cell membrane (D). Yellow, blue, green, central complex; purple, cytosolic ring. (E,F) S. acidocaldarius FlaI (PDB-4IHQ, gold) and Symmdoc model of S. acidocaldarius FlaH (PDB-4YDS, cyan) fitted into the MAC density in side view (E) and in cross-section through FlaH (F); position of cross-section shown as dotted line in E. Scale bars, 20 nm. The periplasmic protein FlaF has been suggested to integrate the archaellum filament into the S-layer (Banerjee et al., 2015), however it is not certain that this protein forms a bona fide conduit through the periplasm. Although the central motor complex is well resolved, both the filament and the regular S-layer structure were averaged out (Figure 2A). This indicates that the filament and motor assembly are not structurally aligned with the S-layer, consistent with the variable angle at which the archaellum crosses the periplasm (Figure 1—figure supplement 3). Whilst some periplasmic densities proximal to the membrane were resolved (Figure 2A), it is not clear if they correspond to an assembly of FlaF or vestiges of the flexible filament. In any case, our data do not show a defined conduit-like-complex that spans the entire periplasm. Since S-layers are two-dimensional porous protein lattices (Engelhardt, 2007), we wondered if the S-layer pores themselves can form conduits for archaellar filaments. To find out if the P. furiosus S-layer indeed fulfils this role, 1951 S-layer units from P. furiosus were aligned and averaged. The resulting map (Figure 3A,B; Figure 3—figure supplement 1) shows a dense protein array of symmetry P1 and lattice parameters of a = 19 nm and b = 17 nm, including an angle of 63.5°. Note that these parameters are inconsistent with the P6 symmetry that has been deduced from freeze-etched P. furiosus cells before (König et al., 2007). As our average has been generated from frozen-hydrated cells, we conclude that they represent the native state of the S-layer, whereas the P6 symmetry suggested earlier (König et al., 2007) may be a misinterpretation due to limited resolution. (A–C) sub-tomogram averaging of the P. furiosus S-layer as tomographic slice (A), segmented 3D surface representation with asymmetric units in different colours (B) and one subunit replaced by a 3D surface-rendered sub-tomogram of a P. furiosus archaellum (C; purple, S-layer; light blue, archaellum). Scale bars, 20 nm. In contrast to the large pores that are often found in S-layers of other archaeal species (Engelhardt, 2007; Veith et al., 2009), the P. furiosus S-layer has narrow, irregular gaps with a maximum width of 3.5 nm. These gaps are evidently too narrow to accommodate the ~11 nm filament, indicating that the S-layer itself does not form a specific guiding scaffold for the archaellum and suggesting that individual S-layer subunits would need to be locally disassembled for the archaellum to pass through. Comparing the S-layer structure to the filament width in silico, we found that removal of a single S-layer subunit would generate sufficient space for the archaellum (Figure 3C). Symmetry breaks and gaps are common in S-layers, as they enable them to form closed cages around cells and are essential for cell division (Pum et al., 1991). However, the mechanism by which the S-layer lattice is locally dissolved to provide sufficient space for the growing archaellum filament is still unknown and awaits further investigation. Previous work has established that the central core of the archaeal motor assembly consists of a complex of the membrane-integral platform protein FlaJ and the soluble, cytosolic ATPase FlaI (Reindl et al., 2013). FlaJ is almost completely buried in the lipid bilayer (Reindl et al., 2013). Due to the high apparent contrast of lipid bilayers in tomograms at high defocus, it was invisible in our average (Figure 2A). However, a superposition of the X-ray structure of the highly conserved S. acidocaldarius FlaI (SacFlaI; PDB-4IHQ) with the membrane-proximal cytosolic part of the sub-tomogram average places the X-ray structure into a density that closely matches its outline. Docking SacFlaI into this position also places the six N-terminal domains of FlaI into the six bridging densities between the central complex and the membrane (Figure 2A,E). This is in good agreement with the current working model of the motor complex, which suggests that these domains act as binding sites for FlaJ (Reindl et al., 2013). According to recently published in vitro binding experiments, FlaI also interacts with FlaH that most likely forms hexameric rings (Chaudhury et al., 2016). We thus generated a 6-fold symmetric model of the homologous S. acidocaldarius FlaH (SacFlaH; PDB-4YDS) and docked it directly adjacent to SacFlaI (Figure 2E,F). This superimposes SacFlaH with a second rounded density that has the dimensions of the hexamer. The resulting model of the FlaI-FlaH complex suggests that FlaH binds as a ring on the cytosolic face of FlaI, in line with previous biochemical data (Chaudhury et al., 2016). After docking FlaI and FlaH into our sub-tomogram averaging map, a large portion of the motor average remains unassigned, especially in its ring region (Figure 2E,F). These densities are most likely occupied by the remaining cytosolic subunits FlaC and FlaD/E encoded in the P. furiosus fla-operon. Higher resolution structures of these proteins need to be obtained to reliably interpret the density of the cytosolic ring. By repositioning the motor assembly averages into tomographic volumes, we visualise their positions and mutual arrangement in whole P. furiosus cells (Figure 4A,B). Strikingly, all motor assemblies co-localise with the polar cap, and they are not observed outside this region (Figure 4B). Subcellular organisation of motor complexes and polar cap. (A) Segmented 3D representation of a tomogram of a P. furiosus cell. Motor complexes (magenta) have been repositioned into the original tomogram using coordinates from sub-tomogram averaging. Medium blue, archaella; purple, S-layer; cyan, cell membrane; green, polar cap. (B) close-ups of the polar region showing layer-like superimposition of motor complexes, polar cap and hexagonal protein array (orange). Note that due to limitations of manual particle picking only subsets of the motor complexes and hexagonal protein arrays are displayed. (C and D) sub-tomogram average of hexameric protein array associated with polar cap as slices through the average (C), as well as segmented surface representation (D) in top (top panel) and side view (bottom panel). Scale bars, 200 nm (A); 50 nm (B); 15 nm (C, D). Close inspection of the polar cap revealed patches of ~9.5 nm hexagonal particles projecting ~15 nm from its intracellular face (Figure 4C,D). Sub-tomogram averaging of 57 units shows that these particles have a sandwich-like structure and assemble into hexagonal arrays (Figure 4C,D; Figure 4—figure supplement 1), with a centre-to-centre distance between closest neighbours of 14 nm. Particles neighbouring the central density are less well resolved (Figure 4C), indicating that the organisation of the array is flexible. Although the identity of protein complexes associated with the polar cap is unknown, their localisation in close proximity to the basal bodies suggests that they are mechanistically linked to archaellar function. In order to determine the structure of the P. furiosus archaellar filament, we collected 297 dose-fractionated movies of isolated fibres and calculated a 3D map using helical reconstruction in Relion 2 (Kimanius et al., 2016; He and Scheres, 2017). The resulting map has an overall resolution of 4.2 Å (Figure 5—figure supplement 1) and reveals a 110 Å-wide helix with a helical rise of 5.41 Å and a rotation of 108.03° (Figure 5A–C, Table 1). The backbone of the archaellum is formed by a bundle of α-helices, surrounded by an outer layer rich in β-strands (Figure 5B). The repeating unit of the helical array is a lollipop-shaped protein with an extended inward-facing α-helix and an outward-facing globular domain of several ß-strands (Figure 5B), consistent with secondary structure predictions for all three FlaB proteins of the P. furiosus fla-operon (Figure 5—figure supplements 3). Structure of the P. furiosus archaellum. (A–C) 3D representation of the 4.2 Å map of the P. furiosus archaellum as seen from the surface (A), and cross-sections parallel (B) and perpendicular (C) to the long axis of the filament. Different colours represent different regions of the archaellum; red, inner helix bundle; white – blue, outer beta-strand-rich sheath; transparent green, outline of one archaellin monomer. Scale bars A, C, 50 Å. (D) Slice through the outer sheath of the filament showing the β-strand rich region of the FlaB0 monomer (yellow) fitted into the map density (transparent grey). Note hydrophobic amino acid side chains pack in the interior of the β-barrel. (E) Close-ups of beta strands of FlaB0 (backbone in blue) fitted into the map density (transparent grey). (F, G) Side view (F) and cross-section (G) of the atomic model of the P. furiosus archaellum with individual FlaB0 subunits in different colours. (H) structure of the FlaB0 monomer coloured by hydrophobicity (red, hydrophobic; blue, hydrophilic). Neighbouring subunits within the filament are shown in transparent grey. (I) structure of the P. furiosus archaellum coloured by hydrophobicity in top view. Statistics of 3D reconstruction and model refinement. To investigate which of the three FlaB proteins constitute the P. furiosus archaellum, we attempted to build atomic models of FlaB0, FlaB1 and FlaB2, using their respective sequences. Guided by large resolved side chains (Figure 5D and E) and the structure of the M. hungatei homolog (Poweleit et al., 2016) as a reference, we were able to build a model based on the FlaB0 sequence (Table 1), but not on FlaB1 or FlaB2. Whilst our density map fitted FlaB0 well, it could not be reconciled with the inserts found in FlaB1 or FlaB2 (Figure 5—figure supplements 3). This suggests that at least the main part of the filament is composed of FlaB0 rather than a combination of all three FlaB proteins, in accordance with previous biochemical data that identified FlaB0 as the major archaellin of P. furiosus (Näther-Schindler et al., 2014). It remains to be investigated, if the minor archaellins FlaB1 and FlaB2 form specific basal or terminal segments of the FlaB0 filament or assemble into distinct filaments of their own. Our density map allowed the FlaB0 polypeptide to be modelled from Ala6 onwards, in accordance with posttranslational removal of the short, positively charged N-terminal MAKKG peptide prior to FlaB0 filament assembly. This signal peptide fits the archaeal consensus cleavage site for class III signal peptides [KRDE][GA][ALIFQMVED][ILMVTAS] (Esquivel et al., 2013). The structure of the FlaB0 monomer consists of an N-terminal α-helix of 47 amino acids (A6 – A52). The first 25 amino acids of the helix (A6 – I30) are hydrophobic, whereas the second half (Q31 – A52) contains predominantly polar residues and is therefore highly hydrophilic (Figure 5H). The TMHMM server predicts most of the hydrophobic sections (V7-L29) as trans-membrane, and the subsequent hydrophilic part of the polypeptide as outward-facing (Figure 5—figure supplement 4). This suggests that in the monomeric, extra-filamentous form of FlaB0, V7-L29 may act as a transmembrane helix, while the remaining domains protrude into the periplasm. The major part of the polypeptide (S53 - Q212) contains 15 β-strands that fold into a twisted β-barrel (Figure 6D) with a hydrophobic interior (Figure 5D,H). Glycosylation of the P. furiosus archaellum. (A) Close-ups of glycan densities near Asn residues. (B) surface representation of EM map showing glycan densities (red) protruding from the filament (shades of grey). (C) Surface representation of the atomic model of the archaellum (shades of grey, individual FlaB0 subunits; red, asparagine residues within glycosylation sequon). (D) stereo view of the P. furiosus FlaB0 monomer in rainbow representation (blue, N-terminus; red, C-terminus) with glycosylated asparagines labelled in red. (E) stereo view of the P. furiosus FlaB0 monomer (dark grey) and glycan structures (red) modelled near glycosylated Asn residues. (F) sequence of P. furiosus FlaB0. Grey, clipped signal peptide; double line, α-helix; single line, β strand; yellow, glycosylated asparagine; blue, T/S residue in conserved glycosylation sequon; every 10th residue of the P. furiosus sequence labelled by a dot. Upon integration into the filament, individual FlaB0 subunits interact with one another in multiple ways. The apolar N-terminal α-helix section establishes hydrophobic interactions with six of its neighbours. The resulting α-helix bundle is buried inside the filament and forms its backbone (Figure 5H,I). As the α-helices are arranged at an angle of ~15° to the long axis of the archaellum, their hydrophilic C-terminal sections are close to the periphery, where they contact neighbouring α-helices and β-strands via hydrogen bonds and electrostatic interactions (Figure 5H–I). In the outer sheath of the archaellum, each β-barrel interacts with six surrounding neighbours, mainly by hydrophilic contacts (Figure 5H–I). Similar to bacterial T4P-like filaments, (Giltner et al., 2012; Pelicic, 2008), the amphipathic character of FlaB0 would provide the driving force for filament assembly, in which hydrophobic domains are buried in the centre and hydrophilic surfaces exposed to the surrounding medium. In line with this, it has been shown that archaellin monomers from denatured archaella can spontaneously reassemble into filamentous structures (Näther-Schindler et al., 2014). Comparing the structure of the P. furiosus archaellum with that of the Methanospirillum hungatei archaellum (Poweleit et al., 2016) as well as the adhesion fibre from the immotile Ignicoccus hospitalis (Braun et al., 2016; Müller et al., 2009) (Figure 5—figure supplement 5A,B), highlights different degrees of domain-specific conservation. Both archaellins (P. furiosus PfuFlaB0 and M. hungatei MhuFlaB3), as well as the I. hospitalis (Iho670) fibre subunit are structurally conserved in the N-terminal helix (Figure 5—figure supplements 6), which in assembly forms the backbone of each filament (Figure 5—figure supplement 5A,B). In addition, the three proteins show the same amphipathic character (Figure 5—figure supplement 5E) and assemble into filaments that have similar helical parameters but distinct diameters (100 Å for M. hungatei, 110 Å for P. furiosus and 158 Å for I hospitalis; Figure 5—figure supplement 5 and A,B). These differences in filament thickness are due to insertions and deletions in the C-terminal beta strand-rich domains of PfuFlaB0, MhuFlaB3 and Iho670 (Figure 5—figure supplements 6), which most likely reflect functional and environmental adaptations in the three species. While building the atomic FlaB0 model, we found large, irregular, outward-facing densities adjacent to five out of 13 asparagine residues (N67, N90, N98, N122 and N128) (Figure 6A), which were not attributable to the polypeptide backbone or nearby sidechains. Analysis of the FlaB0 sequence revealed that these five amino acids were all within a N-X-S/T sequon (Figure 6F), a highly conserved consensus sequence for N-linked glycosylation (Jarrell et al., 2014). Consistent with this finding, the remaining asparagine residues were not part of such a sequon and did not show a similar density nearby. Furthermore, no such densities were observed adjacent to serine, threonine, proline or lysine sidechains, suggesting that O-linked glycosylation is not present in the P. furiosus archaellum. Due to the flexibility of glycan chains, only the densities of the first one or two sugar subunits were present in our map. The N-glycosylation sites are evenly distributed over the exposed part of the iFlaB0 peptide (Figure 6D), thus creating a homogeneous, highly glycosylated surface that covers the entire filament (Figure 6B,C). The universal sequence of the P. furiosus N-glycan has been determined previously by mass spectrometry (Fujinami et al., 2014). To analyse the additional molecular density corresponding to FlaB0 glycosylation, we generated an atomic model of the P. furiosus glycan and placed it adjacent to each of the glycosylated asparagine residues (Figure 6E). The resulting model shows that glycosylation adds a substantial mass to each monomeric unit and thus covers most of the filament surface. This glycosylation pattern differs considerably from the one shown for the archaellum of M. hungatei (Poweleit et al., 2016), which harbours six O-glycosylation sites and two N-glycosylated residues. Although glycosylation has not yet been shown for the I. hospitalis filament, one sequon for N-glycosylation can be found within the polypeptide, suggesting a singular putative ‘sweet spot’ (Figure 5—figure supplement 6). Together with a wealth of previous biochemical data, our new structures of the Pyrococcus furiosus archaellar motor complex, the polar cap, the S-layer, and the archaellum itself enable us to build a first model describing the architecture of the archaellum machinery (Figure 7). Composite model of the archaellum machinery of P. furiosus. Light blue, FlaB0 monomers and filament (from helical reconstruction); hazy magenta, S-layer; solid yellow, blue, green and purple, motor complex; hazy blue, cell membrane; hazy green, polar cap; solid orange, hexagonal protein array (from different sub-tomogram averages). Putative positions of protein subunits are indicated. Dashed grey lines, putative interaction with polar cap. Filament assembly and rotation is powered by the archaellar motor, which is composed of the fully membrane-embedded FlaJ, a bell-shaped cytosolic complex of FlaI and FlaH and a surrounding cytosolic ring, most likely consisting of FlaC and D/E. This ring was not observed in averages of the archaellar motor complex of Thermococcus kodakarensis (Briegel et al., 2017), which may either be due to species-dependent structural differences of motor components or the smaller number of particles used for the T. kodakarensis average. In the periplasm, the filament is thought to be coordinated by FlaF (Banerjee et al., 2015). As no densities spanning the entire periplasm are seen in our sub-tomogram average of the motor complex (Figure 2A), we suggest that FlaF does not form a continuous conduit that connects the membrane and the outer canopy of the S-layer. Instead, this protein may coordinate the archaellum near the membrane, while the main periplasmic part of the filament is flexibly integrated into the S-layer. The archaellar motors are juxtaposed to the polar cap, which in P. furiosus is only present in combination with an archaellar bundle. This confirms earlier findings in H. salinarum (Kupper et al., 1994) and T. kodakarensis (Briegel et al., 2017), which also showed co-localisation of archaella and polar cap. This striking co-localisation indicates that archaella and polar cap are co-regulated and suggests a strong functional connection. It is conceivable that the polar cap functions in concentrating archaella at one cell pole and acts as an anchor to fix the motor complexes in the bilayer to prevent futile rotation. In addition, the polar cap may also prevent the mechanical disruption of the cytoplasmic membrane by the rapid rotation of multiple archaella. The straight sides and tightly bent edges of the polar cap are reminiscent of virus-associated pyramids, the exotic egress structures produced by Sulfolobus-specific viruses upon infection of their hosts (Daum et al., 2014). These observations strongly suggest that the polar cap is composed of protein, rather than lipid. In addition, the polar cap is associated with protein complexes that form hexameric protein arrays. While the identity of these complexes is unknown, their localisation next to the archaellar motors suggests that they may be mechanistically linked to motor function. Many bacteria employ chemoreceptors to sense metabolic gradients and control the direction of swimming motion. These chemoreceptors are typically arranged in hexagonal arrays (Briegel et al., 2009; Liu et al., 2012; Qin et al., 2016) and closely associated with flagellar motors (Liu et al., 2012; Qin et al., 2016; Xu et al., 2011). In Euryarchaeota, genes homologous to bacterial chemoreceptors have been annotated (Schlesner et al., 2009) and chemosensory arrays that are structurally similar to their bacterial counterparts have been described (Briegel et al., 2015). It remains to be investigated if the hexagonal protein arrays found in this study represent an unknown Pyrococcus-specific type of chemoreceptor or some other protein linked to motility. Our observations support the hypothesis that the polar cap does not only function as an anchor for the archaellum, but also as a platform that recruits protein complexes that control swimming motion (Briegel et al., 2017). The P. furiosus archaellum lacks a central channel, consistent with the archaellum of M. hungatei (Poweleit et al., 2016) and the I. hospitalis Iho670 filament (Braun et al., 2016) Figure 5—figure supplement 5A. This supports the hypothesis that archaella and other archaeal filaments assemble from their base, in marked contrast to the assembly of bacterial flagella (Evans et al., 2014). The first steps of archaellum assembly comprise N- or O-glycosylation and removal of the positively charged N-terminal MAKKG signal peptide from membrane-bound FlaB0 monomers. Loss of these positive charges primes the individual archaellins for transfer from the lipid bilayer into the growing filament, aided by the membrane protein FlaJ. This process is driven by the amphipathic surface of the individual archaellins and catalysed by ATP hydrolysis through FlaI (Streif et al., 2008; Reindl et al., 2013). In contrast to the M. hungatei filament (Poweleit et al., 2016), no O-linked glycosylation was found in P. furiosus, indicating that this glycosylation pathway is not present in this organism. The extensive glycan cover of the archaellum filaments likely increases their stability. All but one of the glycosylation sites are situated near the binding interface of adjacent FlaB0 subunits (Figure 6C,D), suggesting that N-linked glycans may enhance filament integrity by additional hydrogen bonds (Lis and Sharon, 1993). Indeed, deletion mutants of different archaeal species lacking important proteins involved in glycosylation pathways are defective in archaellum formation and motility (Jarrell et al., 2014). A high degree of surface protein N-glycosylation has been suggested to be a protection mechanism against heat in the case of (hyper-) thermophiles, or against high pH and salt concentrations in other archaeal extremophiles (Jarrell et al., 2014). In addition, glycosylation of proteins may convey adhesive properties (Lis and Sharon, 1993), resulting in the surface-binding capability of archaella previously observed for adherent P. furiosus cells (Näther et al., 2006). Finally, surface glycans also provide strain-specific recognition signatures for cell-cell interactions, in which archaella seem to play a major role (Näther et al., 2006). In its substance, our model of the archaellum and its motor complex will be universal to all motile Archaea, as the core of the archaellum machinery (FlaA/B, FlaF, FlaG, FlaH, FlaI and FlaJ) is conserved throughout crenarchaeal, euryarchaeal and thaumarchaeal lineages (Albers and Jarrell, 2015; Chaudhury et al., 2016). In contrast, it can be expected that the cytosolic ring will be different in Crenarchaea, which lack genes encoding for FlaC D/E but possess the ring-forming protein FlaX instead (Banerjee et al., 2012). Moreover, together with previous findings (Briegel et al., 2017; Kupper et al., 1994) our data suggest that the polar cap is a unique hallmark of Euryarchaea. Archaeal filament proteins such as the archaellins PfuFlaB0 and MhuFlaB3, as well as the adhesive protein Iho670 share many characteristics with T4 pilins. These characteristics include their overall lollipop-like shape, their amphipathic surfaces and the way they are processed and assembled into a filament. On the sequence level, archaellins and T4 pilins are highly conserved in their N-terminal helix and unconserved in their globular, β-strand-rich domain (Poweleit et al., 2016; Giltner et al., 2012; Pelicic, 2008). It is likely that the N-terminal helix domain remained largely unaltered throughout evolution, as it is the essential backbone-forming domain in T4P and archaella. In contrast, the surface-exposed globular domain is less crucial for filament integrity and could therefore diversify into a versatile and strain-specific interaction interface that adapted to various functions and environments. An extreme example of this diversification are the class III signal peptide-containing sugar binding proteins of the bindosome of Sulfolobus solfataricus (Zolghadr et al., 2007). The ubiquity and conservation of the archaellin/T4 pilin (A/T) blueprint highlights its evolutionary success as an exquisite building block for stable, yet flexible and versatile filaments. The presence of this blueprint in Archaea and Bacteria also raises the intriguing hypothesis that a common A/T-like progenitor protein and filament existed in the last universal common ancestor (LUCA), before these two domains of life diverged more than 3 billion years ago (Makarova et al., 2016; Weiss et al., 2016). Although it is unknown if these primordial filaments were used for rotary propulsion, it has been proposed that pseudopili of T2SS, an evolutionary relative of the archaellar motor, assemble in a rotary ‘spool-like’ fashion (Nivaskumar et al., 2014). This suggests that the ability to gyrate is a general trait of T2SS as well as A/T-like assembly systems. Thus, Archaea appear to have developed the A/T progenitor filament and machinery further into the archaellum, a structurally simple, yet powerful propulsion device. Bacteria on the other hand, have developed this ancestral fibre into T4P, molecular devices used for processes such as twitching motility as well as DNA uptake (Gold et al., 2015). Notably, the architecture of the bacterial T4P assembly machinery differs greatly from the archaellar motor. Whereas the archaellar motor apparently lacks a conduit through the periplasm, the bacterial T4P machinery harbours the PilQ complex, a large, gated molecular machinery that guides the pilus through the peptidoglycan layer and the outer membrane (Gold et al., 2015; Chang et al., 2017, 2016; Kolappan et al., 2016). 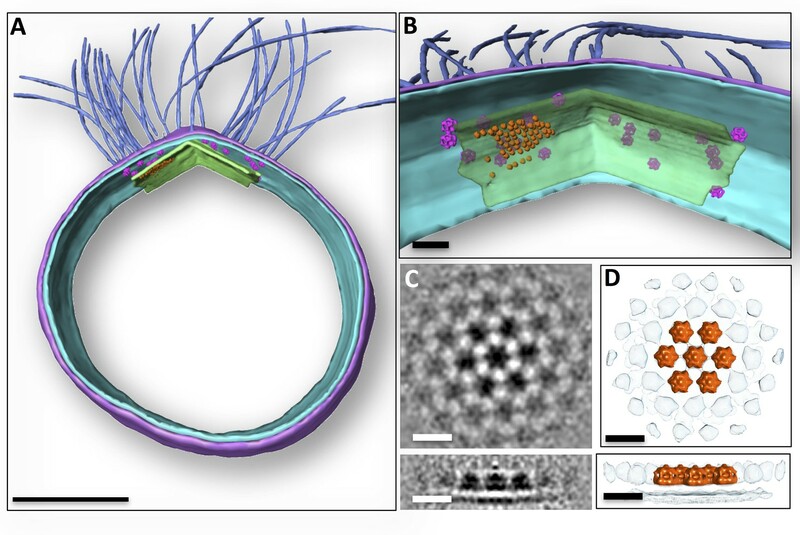 For swimming motion, Bacteria have developed the flagellar machinery, a massive double-membrane spanning macromolecular device that is thought to share a common ancestor with the bacterial type-3 secretion system (Chen et al., 2011; Erhardt et al., 2010). The evolutionary reason for the higher complexity of both, bacterial T4P assembly machines as well as flagellar motors is speculative. However, it may be hypothesised that Bacteria needed to come up with additional protein components for their T4P assembly machinery as well as an entirely different propulsion device as they developed a double membrane, which is, with very few exceptions, not found in Archaea. Pyrococcus furiosus type strain DSM3638 was obtained from the in-house culture collection at the University of Regensburg. Cells were grown in serum bottles containing 20 ml minimal SME pyruvate medium (= modified SME medium supplemented with 0.025% yeast extract and 40 mM pyruvate), pressurized with 100 kPa N2 (Reichelt et al., 2016). Incubation took place overnight at 95°C. Cells were decanted from serum bottles into 15 ml tubes and pelleted at 2500 g. The cell pellet was resuspended in 2 pellet volumes of buffer and mixed 1:1 with 10 nm colloidal protein-A gold (Aurion, Wageningen, The Netherlands). 3 µl of this suspension were applied to glow-discharged 300 mesh copper Quantifoil grids (R2/2, Quantifoil, Jena, Germany), blotted for 3–5 s and rapidly injected into liquid ethane using a homemade plunge-freezer. Tomograms were recorded using a Polara G2 Tecnai TEM (FEI, Hillsboro, USA) operating at 300 kV. The Polara was equipped with a Gatan Tridiem energy filter (Gatan Inc., Pleasanton, USA) and a 4 × 4 k K2 Summit direct electron detector (Gatan Inc., Pleasanton, USA) running in counting mode. Tilt series were collected in zero-loss mode using Digital Micrograph (Gatan, Pleasonton, USA) from max. −68° to +68° and in steps of 2°. The magnification was set to 41,000 x resulting in a final pixel size of 5.4 Å, and a defocus of 6–8 μm was applied. Tomograms were recorded in dose-fractionation mode at a dose rate of 8–10 e− px−1 s−1 and a maximum total dose of 100 e− Å−2. Dose-fractionated tilt images were aligned using an in-house script based on IMOD (Kremer et al., 1996) programmes and reconstructed into tomograms using the IMOD software package (Kremer et al., 1996). Final tomograms were binned 2-fold and contrast-enhanced using non-linear anisotropic diffusion (Frangakis and Hegerl, 2001). 3D surface annotation (segmentation) was performed using AMIRA (FEI, Hillsboro, USA). To obtain averages of motor complexes, 379 individual sub-volumes were picked from 50 tomograms binned twofold to a pixel size of 10.8 Å and filtered by NAD (Frangakis and Hegerl, 2001) as implemented in IMOD (Kremer et al., 1996). For each particle, two coordinates were selected, of which the first marked the centre of the periplasm and the second marked the central part of the motor density. Two of three Euler angles (Psi and Theta) were roughly determined by the two contours. Particles were then pre-aligned and averaged using IMOD (Kremer et al., 1996) and Spider (Shaikh et al., 2008) as previously described (Davies et al., 2011). This rough average was used as initial reference for PEET (Nicastro et al., 2006), in which particle alignment was refined. 6-fold symmetry was applied by duplicating and rotating particles by 0, 60, 120, 180, 240 and 300° around the symmetry axis. The membrane and surrounding noise were excluded by a cylindrical mask around the motor complex. To increase map resolution, averages were recreated without additional alignment search, using unfiltered tomograms binned twofold to a pixel size of 10.8 Å. Fourier shell correlation (FSC) of two particle half-sets as implemented in IMOD (Kremer et al., 1996) was used to estimate the resolution of the resulting map at the 0.5 criterion. For this, the central particle was masked using a box of x,y,z = 30,30,30 nm. This analysis revealed an estimated resolution of 68 Å (Figure 2—figure supplement 2). To analyse the 3D organisation of motor complexes in situ, averaged particles were placed back into their relative positions and orientations using the EM-Package in Amira (FEI, Hillsboro, USA). To average the S-layer, a random grid of 1951 points was applied over the S-layer within a tomogram of a P. furiosus cell that was binned twofold to a pixel size of 10.8 Å and filtered by NAD (Frangakis and Hegerl, 2001). Using PEET (Nicastro et al., 2006), subvolumes of x,y,z = 60,60,40 pixels were extracted, aligned and averaged. To average the accessory protein array, 57 subvolumes were selected manually using a tomogram of a P. furiosus cell that was binned 2-fold to a pixel size of 10.8 Å and filtered by NAD (Frangakis and Hegerl, 2001). Using PEET (Nicastro et al., 2006), subvolumes of 80 × 80 × 80 pixels were extracted, aligned and averaged applying 6-fold symmetry. S-layer and protein array were visualised and segmented using UCSF Chimera (Pettersen et al., 2004). The resolution of both averages was estimated based on reflections in their respective power spectra calculated by IMOD (Kremer et al., 1996). This suggested a resolution of ~52 Å for the average of the S-layer (Figure 3—figure supplement 1) and ~49 Å for the hexagonal protein array (Figure 4—figure supplement 1). Preparation of archaella was adapted from Näther et al. (2006). P. furiosus was grown in modified SME medium supplemented with 0.1% yeast extract, 0.1% starch, and 0.1% peptone at 95°C in a 50 l fermenter (Bioengineering, Wald, Switzerland) pressurized with 100 kPa N2/CO2 (80:20). After harvesting (7,000–8,000 × g), cells were concentrated (3,500 × g, 30 min, 4°C; Sorvall RC 5C plus, rotor GS3), and archaella were sheared (Ultraturrax T25, IKA-Werke, Staufen, Germany; 1 min at 13,000 rpm and 10 s at 22,000 rpm). Cell debris was removed by centrifugation (34,500 × g, 4°C; Sorvall RC 5C plus, rotor SS34) for 20 min. Archaella were pelleted from the supernatant by ultracentrifugation (60,000 × g, 90 min, 4°C; Beckman Optima LE-80K, rotor 70Ti), resuspended in 150 μl 0.1 M HEPES pH 7.0 and purified for 48 hr (250,000 × g, 4°C; Beckman Optima LE-80K, rotor SW60-Ti) using a CsCl gradient (0.45 g/ml). Fractions were taken by puncturing the ultracentrifuge tubes with sterile syringes and dialysed against aerobic ½ SME/5 mM HEPES pH 7.0. After identification of the archaella-containing band by SDS-PAGE and TEM, the respective sample was stored at 4°C for further analysis. Overexpression constructs of StrepII-tagged Pf FlaI (Table 2) were transformed into E. coli codon plus (Rosetta) cells and grown as preculture overnight at 37°C in LB medium containing ampicillin (50 μg/ml) and chloramphenicol (34 μg/ml). 2 l of fresh medium containing antibiotics were inoculated with 10 ml preculture and grown at 37°C to an OD600 of 0.6–0.7. Subsequently, the cultures were cooled down on ice for 30 min and induced with 0.3 mM of isopropyl β-D-thiogalactopyranoside. Growth was continued for 16 hr at 18°C. Cells were collected by centrifugation, frozen in liquid nitrogen and stored at −80°C. Plasmid used in this study. Primers used in this study. Relevant restriction sites are underlined. Cells expressing Pf FlaI were thawed on ice and resuspended in lysis buffer (20 mM Tris-HCl pH 8, 150 mM NaCl, 0.5% TritonX100) containing complete EDTA-free protease inhibitor cocktail (Roche) (5 ml/g of pellet). DNase I was added (a pinch) and kept on ice for 30 min. The cells were lysed using a Microfluidizer with 1000 psi three times and centrifuged at 4,600 g for 20 min to remove cell debris and then centrifuged at 20,000 g for 20 min at 4°C. For affinity chromatography, Streptactin column material (IBA GmbH, Göttingen, Germany) was prepared in columns equilibrated with purification buffer, 20 mM Tris/HCl pH 8, 150 mM NaCl (buffer A) and proteins were eluted in buffer A containing 2.5 mM desthiobiotin. The protein was purified further by size exclusion chromatography, where Pf FlaI was concentrated to 1 mg/ml in buffer A using 10 kDa cutoff Amicon concentrators (Millipore). 500 µl of the concentrated samples was then applied to a Superdex 200 10/300 GL size exclusion column equilibrated with buffer A. Fractions were analysed on SDS-PAGE. Thyroglobulin (669 kDa), γ globulin (158 kDa), ovalbumin (44 kDa), myoglobin (17 kDa) and vitamin B12 (1.35 kDa) were used as size standards. Purified FlaI was diluted 1:5 in buffer A and 3 µl of this suspension were added to 300 or 400 mesh continuous-carbon copper grids. After 1 min incubation, the suspension was washed 1 x with 3 µl buffer and subsequently 3 µl uranyl acetate stain were added. After incubation for another minute, excess uranyl acetate was removed and grids were transferred into a FEI Tecnai Spirit TEM (Eindhoven, The Netherlands) operating at 120 kV. Images were recorded on a Gatan US 4000 camera (Gatan Inc., Pleasanton, USA) at a pixel size of 1.4 Å and a defocus range of 1–3 µm using the LEGINON software (Suloway et al., 2005). 2D classification of 130,000 auto-picked particles was performed using the software Relion-2.0 (Kimanius et al., 2016). Isolated P. furiosus archaella were diluted 1:5 in Millipore water and 3 µl of the suspension was applied to glow-discharged 300 mesh copper Quantifoil grids (R2/2, Quantifoil, Jena, Germany). The grids were plunge-frozen in liquid ethane with a Vitrobot III (FEI, Eindhoven, The Netherlands) using a blotting time of 7–10 s and transferred at liquid nitrogen temperature into a JEOL JEM 3200 FSC operating at 300 kV. Dose-fractionated movies were collected using a K2-Summit detector running in counting mode. The slit width of the in-column energy filter was set to 20 eV. 40-frame movies were recorded at a defocus of 1–3 μm with an exposure time of 8 s and a total dose of 60 e−/Å2. 297 movies were drift-corrected and dose-filtered using Unblur (Grant and Grigorieff, 2015) and 4712 helices were manually picked using the programme Helixboxer of the EMAN-2 package (Ludtke et al., 1999). Subsequent image processing included CTF-correction, particle extraction, 3D classification, 3D refinement and B-factor sharpening and was performed in Relion-2.0 (He and Scheres, 2017). In brief, each filament was subdivided into boxes of 200 × 200 pixels in size at an offset of 10 Å, resulting in 74,823 overlapping segments. Next, a 3D consensus map of all extracted particles was calculated, by performing a narrow-range angular and translational search around the helical parameters published for the M. hungatei archaellum (Poweleit et al., 2016). The resulting consensus map was used as reference in a 3D classification step to sort out bad, bent or misaligned filaments. The best class including 13,965 helical segments was subjected to another round of 3D refinement in which helical parameters were further improved. This resulted in a map with a resolution of 4.2 Å by gold-standard FSC (Figure 5—figure supplement 1). In a final post-processing step, the map was sharpened using a B-factor of −200 Å2. Statistics of 3D reconstruction and model refinement can be found in Table 1. Sub-tomogram averages as well as the archaellum structure were displayed and analysed in UCSF Chimera (Pettersen et al., 2004). The same programme was used to perform rigid body fitting of X-ray structures of S. acidocaldarius FlaI (PDB-4IHQ) and FlaH (PDB-4YDS) into the sub-tomogram average. SymmDock (Schneidman-Duhovny et al., 2005) was employed to generate multimeric rings from the S. acidocaldarius FlaH monomer. The atomic model of the archaellum was built in Coot (Emsley et al., 2010) aided by homologous M. hungatei FlaB3 (PDB 5tfy). Non-homologous features were built manually. The structure was refined by Phenix (Afonine et al., 2012) real space refinement followed by manual rebuilding in Coot. The final model contains all 207 amino acid residues of the mature protein (Pettersen et al., 2004). Multiple sequence alignments were calculated using the Praline server (http://www.ibi.vu.nl/programs/pralinewww/). The sequence for the P. furiosus glycan was converted into a molecular model using the SWEET2-server http://www.glycosciences.de/modeling/sweet2/doc/index.php. The cryo-EM maps were deposited in the Electron Microscopy Data Bank with accession codes EMD-3759 (motor complex), EMD-3760 (hexagonal protein array) and EMD-3746 (archaellum). The structure coordinates of the atomic model of the archaellum were deposited in the Protein Data Bank with accession number 5O4U. Journal of Biological Chemistry 287:43322–43330. Journal of Structural Biology 160:115–124. Journal of Structural Biology 135:239–250. Microbiology and Molecular Biology Reviews 76:740–772. Journal of Structural Biology 198:163–176. Applied and Environmental Microbiology 78:1670–1674. Microbiology and Molecular Biology Reviews 78:304–341. Seminars in Cell & Developmental Biology 46:113–127. 315–340, Proteinaceous surface layers of Archaea: ultrastructure and biochemistry, Archaea: Molecular and Cellular Biology (American Society of Microbiology), 10.1128/9781555815516. Applied and Environmental Microbiology 77:2232–2238. European Journal of Biochemistry 218:1–27. Type IV pili: e pluribus unum? Current Opinion in Microbiology 14:357–363. Journal of Molecular Biology 384:1–8. Applied and Environmental Microbiology 76:3308–3313. Thank you for submitting your article "Structure and in situ organisation of the Pyrococcus furiosus archaellum machinery" for consideration by eLife. Your article has been favorably evaluated by John Kuriyan (Senior Editor) and three reviewers, one of whom is a member of our Board of Reviewing Editors. The reviewers have opted to remain anonymous. This manuscript describes structural studies of the Pyrococcus furiosus flagellar machinery. 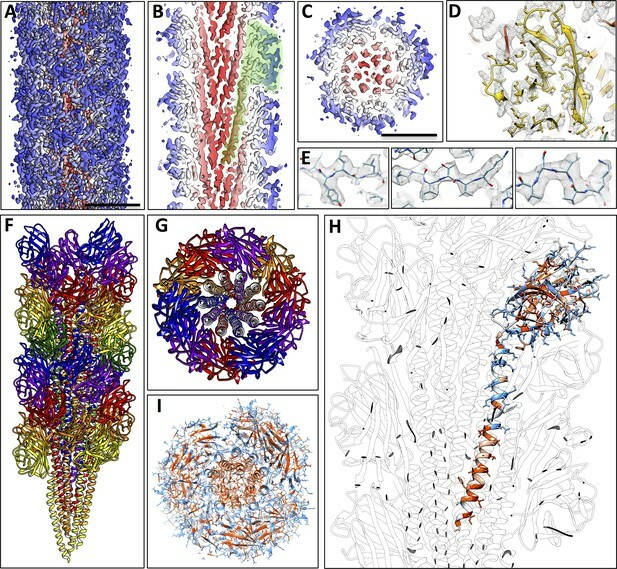 Using a combination of electron cryo-tomography, sub-tomogram averaging, single-particle cryoEM and helical reconstruction, the authors generated a partial model of the machinery. The main concerns raised were that portions of the model are quite speculative given the very low resolution and incompleteness, while the higher resolution component (the flagellar filament) lacks novelty. Nevertheless, it was felt that a substantially revised paper could make contributions to the field. The following points raised by the reviewers must be addressed in the revised manuscript. Note that no additional experimentation is specifically asked for. These queries concern justification of statements, or clarification of interpretations. In some cases, the points made refer to issues that the reviewers feel are not well justified, and if the justification cannot be improved you may wish to remove the pertinent discussion or downplay it. Please provide a point-by-point response to these queries along with the revised manuscript. Methanospirillum hungatei archaellum (Nat Microbiol. 2016 2:16222. doi: 10.1038/nmicrobiol.2016.222). The conclusion that it provides the first model of the entire machinery is, however, overstated, since the authors themselves admit that some components cannot be identified. Much of the data is observational and assignments not confirmed by generation and imaging of isogenic mutants (e.g. FlaCDE) as has been done in other studies cited above. A "large portion of the motor… remains unassigned". We therefore suggest toning down the claim (both in the Abstract as well as in the main text) that a structural model of the entire archaellum is presented. A structural model of the entire complex would require having every piece of density assigned. The paper must be revised to address these limitations. 2) "Archaea are ubiquitous microorganisms that are thought to be the ancestors of eukaryotes (Zaremba-Niedzwiedzka et al., 2017)." This remains controversial. They should look at papers such as: Nasir, A., Kim, K.M., Da Cunha, V., and Caetano-Anollés, G. (2016). Arguments Reinforcing the Three-Domain View of Diversified Cellular Life. Archaea 2016. Further, Zaremba-Niedzwiedzka et al., 2017 has been called into question by a number of people, and at least one paper is in press providing alternate interpretations for the metagenomic data analyzed as coming from "Lokiarchaeota" (namely, that there is no single organism that was being sequenced). 3) (Introduction) "Proton motive force". In fact, some bacterial flagellar motors are powered by a Na gradient. They should replace "proton motive force" with "ion fluxes". 4) "As FlaJ is almost completely buried in the membrane (Reindl et al., 2013), it is concealed by the lipid bilayer in our average". This makes no sense. It is not as if the authors are using metal shadowing to look at these structures. They are doing cryo-ET, and it is impossible to understand how the bilayer can be "concealing" the protein. They then go on to dock an x-ray structure into the density that is apparently "concealed". 5) (Subsection “Location of motor subunits”) The model for the FlaI-FlaH complex is quite weak due to the limited resolution. Can a better justification for the model be provided? 6) (Subsection “Structure of the P. furiosus archaellum”) The model for the FlaB filament used the M. hungatei structure as a reference. Nowhere is there any comparison between their P. furiosus filament and the previous structures from M. hunatei or I. hospitalis. How similar are these? What is conserved among the three and what varies? 7) (Discussion) "We suggest that FlaF does not form a continuous channel." In membrane biology, "channel" has a very specific meaning, and it appears that the authors are not referring to a pore of any sort. Further, it is also possible that the arguments in Banerjee et al. 2015 are flawed. The main argument for this location of FlaF seems to be that it bound S-layer proteins in vitro. But an obvious control, of showing that FlaB does not bind these proteins, was never done. 8) (Subsection “Assembly of the archaellum machinery”, fourth paragraph) The suggestion that some/many chemoreceptors form hexagonal arrays, and therefore that the hexagonal arrays found in this study may be an as yet unknown chemoreceptor, appears pretty weak. 9) (Discussion) "…Classes the P. furiosus archaellum as T4P-like filament". The homology between T4P and archaeal flagellar filaments only involves the N-terminal α-helical domain, including the leader sequence and the processing of this leader by a specific protease. There is no apparent homology, from either sequence or structure, between the large globular domain in archaeal flagellar filaments and any T4P. The "versatility" of the C-terminal domain is due to a gene fusion! 10) (Discussion) "Bacteria on the other hand have developed the far more complex flagellum based on the type-3 secretion system instead (Chen et al., 2011; Erhardt, Namba and Hughes, 2010)." We do not know of anyone other than the authors who thinks that the flagellum evolved from a T3SS. In fact, if one looks at reference (Erhardt, Namba and Hughes, 2010) which is cited, it states that the dogma in the field has been that the T3SS evolved from flagellar, but some new work suggests a common ancestor for both. 11) (Subsection “Electron cryo-tomography of Pyrococcus furiosus”, last paragraph) The polar cap seems to be associated with the machinery but its composition is unknown. If it is only present when archaella are present, is it possible to speculate on its composition based on genetic conservation in other species that also have this structure? Are there unassigned ORFs in archaella operons that might encode its constituents? 12) (Subsection “Integration of the archaellum into the periplasm”, last paragraph) The idea that S-layer subunits would need to be missing to accommodate the filament's passage in the absence of a dedicated channel requires better support. How likely is it that a hyperthermophile could tolerate missing S-layer subunits – would this destabilize the array? What evidence is there that such gaps actually occur? Do other surface structures use native gaps such as these? 13) The argument that the angles at which filaments cross the periplasm supports random egress needs better support as well; what is the chance that angled filaments are an artefact of processing? How would filaments emerging at random angles affect archaellum function and coordination? Could swimming occur efficiently if the archaella are not aligned? 14) (Subsection “Location of motor subunits”, first paragraph) Calling FlaJ a "secretin" is confusing, as this term is associated with outer membrane oligomers in gram negative type IV pilus and type II secretion systems. Instead it appears to be orthologous to the platform protein PilC that coordinates subunit assembly in related systems. 15) (Subsection “Sub-cellular organisation of motor complexes and the polar cap”, last paragraph) Averaging of only 57 units seems low – what is the confidence level of this information? 16) (Subsection “Structure of the P. furiosus archaellum”, second paragraph) The assignment of FlaB0 as the main subunit should be supported by imaging of mutants, or stated with less certainty. 17) (Subsection “Structure of the P. furiosus archaellum”, last paragraph) The angle at which the helices are arranged should be stated more clearly here. How variable is this arrangement? 18) (Subsection “N-glycosylation of the P. furiosus archaellum”) What is the justification for the assignment of N-glycans to these densities? Where they confirmed by mutation of one or more sites to a non-acceptor? Although complete loss of glycosylation prevents assembly, it is possible to reduce the number of sequons without impeding filament formation. 19) (Discussion) The Discussion could better position the new information in context with what has been observed in other systems as listed above. How do the details described here advance the field? How do the systems compare? How representative of archaella machineries is this one? What does "coordinated by FlaF" mean? This is a vague term. 20) (Subsection “Assembly of the archaellum machinery”, fourth paragraph) The paper provides no data supporting the "docking station" concept, and chemoreceptors usually have surface exposed ligand binding domains, which I didn't see here as the polar cap is positioned well below the membrane. 21) (Subsection “Assembly of the archaellum machinery”, last paragraph) Can the functional properties conferred by glycosylation be deconvolved from its requirement for filament polymerization? If they don't make filaments in the absence of glycosylation, one cannot conclude that glycosylation is important for adherence. 22) (Subsection “Evolutionary aspects”, last paragraph) Type IV pili do not rotate – their motors do. 23) Is there a hole visible in the docked FlaI structures (Figure 2E, gold) and what is the diameter? Could the entire filament (diameter 11nm) fit into the FlaI ring or maybe only the helical core? 24) The last figure (Figure 5—figure supplement 4; transmembrane helix prediction) is not necessary and should be deleted. 25) For the filament structure at 4.2 A, a typical "Table 1" should be provided with information on data collection statistics, refinement statistics and model quality descriptors (Geometry, Ramachandran, Clash, Molprobity), ideally also EMRinger score, etc. It should also be described what kind of additional restraints were used in the Phenix refinement (e.g. Ramachandran, secondary structure, etc.). 26) "It is conceivable that the polar cap functions to concentrate archaella at one cell pole and acts as an anchor to prevent mechanical disruption of the cytoplasmic membrane by the rapid rotation of multiple archaella." One might assume that the forces needed to rotate the filaments are very large compared to the forces needed to rotate the (unfixated) motor complex in the lipid bilayer. Rather than just prevent disruption, one would think that the polar cap is required first of all to fix the motors, otherwise only the motors would rotate and the long filaments would stand still; in particular since there does not seem to be any anchoring to the periplasm. Is there any idea why there is a kink in the polar cap? We have deleted the statement to avoid controversy. We have changed the wording as suggested. The orientation of FlaI is based on the interaction known from type II secretion ATPases with their cognate membrane protein. The orientation of the FlaH hexamer was guided by experiments that have not been published yet, but which indicate that this is the interaction interface. We intend to publish these results in a follow-up study. We have created two new supplementary figures (Figure 5—figure supplement 5 and Figure 5—figure supplement 6) and added two new paragraphs to the Results (–subsection “Structure of the P. furiosus archaellum”, last paragraph) as well as to the Discussion (subsection “Assembly of the archaellum machinery”, fifth paragraph), in which we now compare these three filaments and their component proteins in detail. We would like to emphasise that the filaments of P. furiosus and M. hungatei are both true archaella and more closely related to each other than to the Iho670 fibre of the immotile I. hospitalis, which is most likely an adhesive filament. 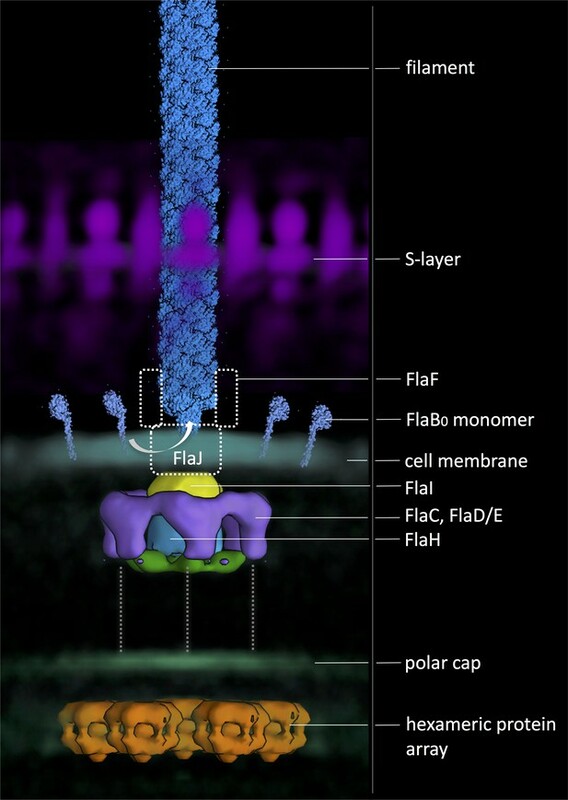 The function of FlaF is not known, but it is the only archaellum protein which has been shown to interact with an extracellular component of the cell, the S-layer (Banerjee et al., Structure, 2015) and it was therefore proposed that it helps to anchor the archaellum in the cell envelope. We are not sure how to interpret the comment of the reviewer that these results might be “flawed”. As a control, the cytoplasmic FlaI was shown not to interact with the S-layer and FlaB was not part of the mentioned study. However, it is indeed not known how FlaF interacts with the S-layer or FlaG or FlaB. All these three proteins exhibit a globular domain which is predicted as archaellin domain, and the FlaF structure was even used to model the Ignicoccus Type IV pilus filament. Therefore, it is very likely, that all three proteins, FlaG/F and FlaB are extracellular as proven for FlaF and FlaB. We agree with the reviewer have re-written the Discussion accordingly (“Evolutionary aspects Evolutionary aspects”). Changed to: “For swimming motion, Bacteria have developed the flagellar machinery, a massive double-membrane spanning macromolecular device that is thought to share a common ancestor with the bacterial type-3 secretion system”. The Pyrococcus furiosus archaellum (fla-) operon does not show unassigned regions that could encode for the polar cap. We suspect that this structure may be found in regions neighbouring the Pfu fla-operon that encode for putative proteins or may be under control of the fla-operon transcriptional regulator (EarA; Ding et al., Mol Microbiol, 2016). As blast search of these genes did not reveal significant homology with other known proteins, we are currently attempting to isolate the polar cap structure to analyse its composition via mass spectrometry. Although archaella appear to traverse the periplasm at random angles, they are in fact perpendicular to the plane of the polar cap (Briegel et al., bioRxiv, 2017). We have made the same observations in Methanocaldococcus villosus with cells that were high-pressure frozen or chemically fixed before embedding and sectioning (unpublished results) and in frozen-hydrated P. furiosus cells (this paper). Thus, it is unlikely that the angular variability of the archaella is an artefact of sample preparation. This angular variability of the P. furiosus archaella is also fully consistent with both, the missing periplasmic conduit as well as the absence of a structure analogous to the bacterial flagellar hook. In contrast to bacterial flagella, archaella are slightly bent along their entire length and are not guided through the S-layer by a specific complex. Thus, it is not surprising that a slight bending in the periplasm is observed. In the absence of a hook, the inherent curvature is likely to increase the efficiency of rotary propulsion. Indeed, P. furiosus is a very efficient swimmer (Herzog & Wirth, Appl. Environ. Biol., 2012). However, as all these points are speculative, we would prefer not to elaborate on them in the manuscript. We have rephrased the wording from “secretin” to “platform protein”. The arrays have six-fold symmetry, and we applied this symmetry during sub-tomogram averaging. Thus, the final number of averaged sub-volumes was 342, in line with other sub-tomogram averaging studies and yields a significant level of confidence. FlaB0 has already been shown to be the main constituent of the P. furiosus archaellum in a previous study involving using N-terminal sequencing and RT-PCR (Näther-Schindler et al., Front Microbiol, 2014). “This shows that at least the main part of the filament is composed of FlaB0 rather than a mixture of all three FlaB proteins, confirming biochemical data that identified FlaB0 as major archaellin of P. furiosus”. The helices are arranged at an angle of 15 degrees with respect to the axis of the filament. This has now been stated in the fourth paragraph of the subsection “Structure of the P. furiosus archaellum”. Judging from our structure, this arrangement is not variable. N-glycosylation is the most common form of glycosylation in Archaea and it has been shown previously that most archaella are highly glycosylated (Nikhil et al., FEMS Microbiol Rev, 2001). It has also been demonstrated by Periodic acid-Schiff staining that P. furiosus archaella are indeed glycosylated (Näther et al., J Bac, 2006). In our structure of the archaellum, all asparagine residues of FlaB0 that are part of a N-X-S/T (N-glycosylation) sequon, showed a large density next to these residues that could not be assigned by the polypeptide backbone or another side chain. Similar densities have been attributed to glycosylation sites of the archaellum from M. hungatei before (Poveleit et al., Nat. Microbiol., 2016). Conversely, none of the asparagines outside a N-X-S/T sequon showed such a large neighbouring densities in our structure. Thus, we are confident about our conclusion that these sites are indeed N-glycosylated. Generating new high-resolution structures of site-specific mutants is obviously not within the scope of this study but will be subject of future research. We have included a comparison between the bacterial T4P machinery and the archaellar motor in the Discussion, subsection “Evolutionary aspects”, second paragraph. We have also included two new figures to compare the P. furiosus archaellum with that of M. hungatei and the I. hospitalis fibre (Figure 5—figure supplement 5 and Figure 5—figure supplement 6) and added two new paragraphs comparing these three filaments in the Results (subsection “Structure of the P. furiosus archaellum”, last paragraph) as well as the Discussion section (subsection “Structure of the P. furiosus archaellum”). We have also included a statement highlighting the significance of our model for the field in the last paragraph of the subsection “Assembly of the archaellum machinery”. We have changed the wording to avoid the speculative term “docking station”. “The extensive glycan cover of the archaellum filaments likely increases their stability. […] Finally, surface glycans also provide strain-specific recognition signatures for cell-cell interactions, in which archaella seem to play a major role. “Although primordial T4P were likely not used for rotary propulsion, it has been proposed that pseudopili of T2SS, an evolutionary relative of the archaellar motor, rotate during assembly”. There is indeed a hole in the docked FlaI X-ray structure, which in theory would be large enough to accommodate the helical core of the filament. However, it is unlikely that the filament protrudes into this hole as the helices at its end are fully embedded in the lipid bilayer, while FlaI is positioned in the cytoplasm. It is more likely that the helical core of the filament interacts directly with the membrane-integral platform protein FlaJ during assembly and rotation. We do think that this figure is important, as we refer to it in the Results section and have therefore decided to leave it in the manuscript. Table 1 has been included and is referenced in the Results and Materials and methods sections. We have incorporated this reviewer’s suggestion into our Discussion. We thank Deryck Mills for keeping our electron microscopes in perfect working order, Edoardo D’Imprima for advice on single-particle EM, Carsten Sachse for guidance on helical reconstruction and Vicki Gold and Harald Huber for many inspiring discussions. We also acknowledge Thomas Hader, Konrad Eichinger and Dina Grohmann for supporting the mass cultivation of P. furiosus cells. This project was funded by the Max Planck Society (BD, JV, WK), the University of Exeter Research Fellow’s Startup grant (BD), the ERC starting grant ‘ARCHAELLUM’ (511323; SVA) and the University of Regensburg (ReR, RaR, AB).